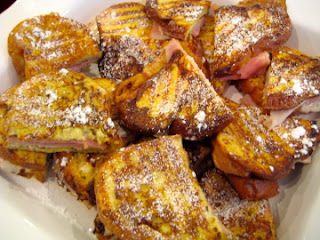 When we were planning the Starfish Reunion brunch menu, my daughter Kayla requested French Toast Monte Cristo sandwiches... I think she would eat this for every meal, if possible. They were a big hit with the bridal party and so simple to make. Blend eggs, milk, cinnamon and vanilla together in a medium bowl. Dip bread in mixture to coat. Saute until golden brown on both sides. Two slices needed for each sandwich. Place filling ingredients between 2 slices of bread and toast in a panini press or cook on griddle or even the non-stick pan used to make the French Toast. Remove from pan and sprinkle with powdered sugar. Melt 1/4 c. of strawberry jelly in microwave. Dip sandwich in jelly and devour!